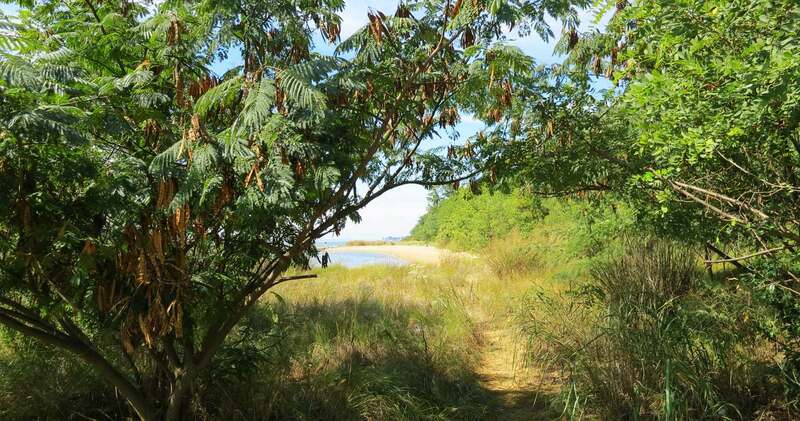 Pastoral, undeveloped, and surrounded on 3 sides by water, you’ll feel as if you’ve stepped onto the set of The New World or stepped back in time 300 years when you arrive on the peninsula of Newtowne Neck State Park. Bounded by Breton Bay, the Potomac River, and Saint Clements Bay, the 776-acre park has 7 miles of scenic, sandy shoreline. Two primitive paddle-in campsites, located to provide a quiet and secluded “backcountry” experience, are ideal for multiday and overnight paddling trips. The Maryland Department of Natural Resources purchased Newtowne Neck in late April of 2009 from the Maryland Province of the Society of Jesus, order of Catholic priests called Jesuits. The Jesuits had owned the property, along with several other parcels on the Potomac for nearly 300 years. The land was purchased to protect the ecologically and recreationally important waterfront from development. The park’s outstanding scenery, water access, gentle topography and significant history offer something for everyone. In 1634, English colonists sailed up Saint Clements Bay aboard the Ark and the Dove, seeking religious freedom. Today, thanks to the acquisition and conservation by Maryland Park Service of this pristine riverfront farmland, you can paddle the same waters to find freedom from the hustle of the modern world.